Wow! If those folk that were putting in the weather stations in Wyoming didn’t want to get too far from a decent highway, that situation is even more the case in North Dakota. It is not exactly a symmetrical spread across the state. 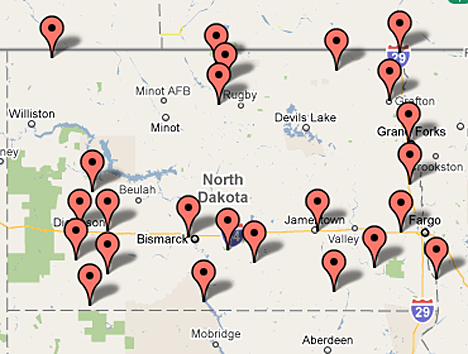 Location of the USHCN stations in North Dakota. 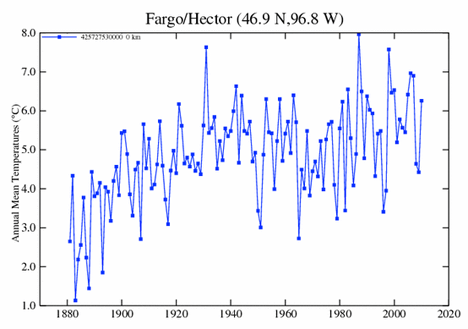 As well as the 24 USHCN stations, there are 3 GISS stations in ND, according to Chiefio, and they are at Fargo, Williston and Bismark. 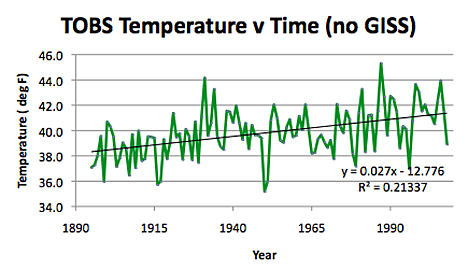 Which of these, I wonder, will turn out to be only from 1948? (answer below the fold). 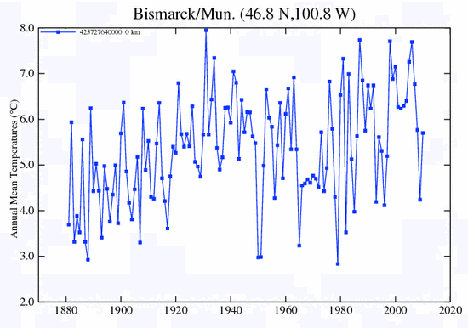 Well Bismark has a full set of data. 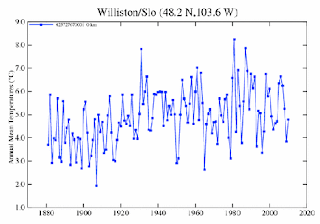 Well, minor surprise, we also have a full set of data for Williston. So I am wrong in North Dakota. 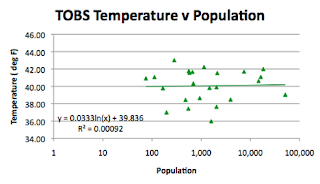 So having got all that information tabulated, we need to go and get the population data. 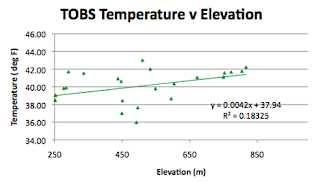 Moffit was too small for citi-data, but exists in Fizber. 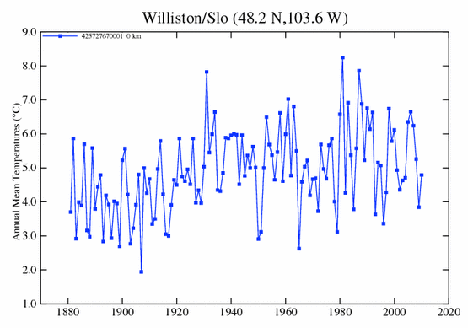 Other than that all the populations were available, and, as has become evident in other states, the GISS stations are in the places with the largest populations relative to the USHCN stations. The average of the USHCN stations is a population of 5,313, though there are only four above 10,000. The GISS stations are in cities that average ten times that size. 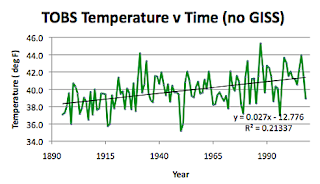 Comparing the GISS average to that of the USHCN stations (using the homogenized data) the average difference is some 1.2 degrees. 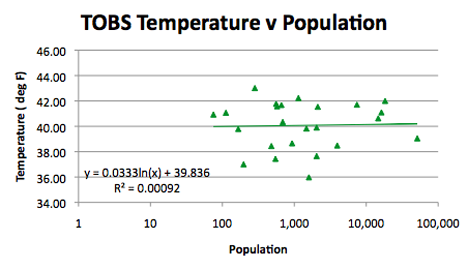 Difference between the average GISS station temperature and that of the average USHCN station in N Dakota. 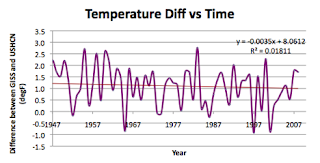 Looking at the overall trend of the temperature in the state, the temperature has been relatively steadily increasing since temperatures were first recorded. 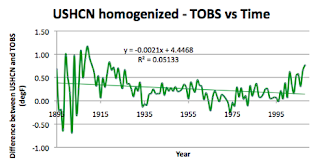 Interestingly the TOBS data suggests that the rise is some 2.7 deg per century, the homogenized data suggests that the rise is only 2.4 degrees. Time to take a look at the geographical information for the state, which is 340 miles long and 211 miles wide. 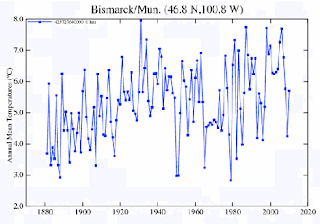 It runs from 97 deg to 104 deg W, and sensibly 46 deg to 49 deg N. North Dakota has an average elevation of 579 m, with the lowest point being at 228 m, and the highest 1,068 m. The average of both the the USHCN stations is 503 m, that of the GISS stations 455 m.
As I have discussed before, this correlation is potentially an artifact of change in elevation, though when I look at this correlation for North Dakota . . . .
Change in temperature with elevation in North Dakota. 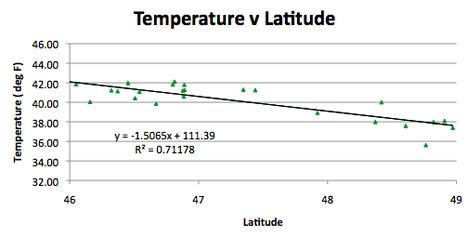 Now that is interesting – it gets warmer as the elevation rises – which is counter intuitive and counter to most of the rest of the states. And there is a reasonable correlation coefficient – most strange. 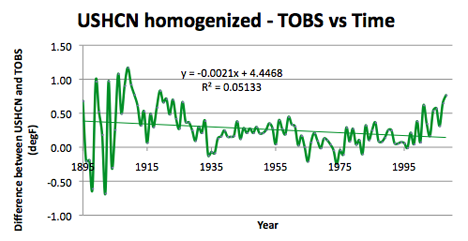 And, as with Wyoming, the difference between the homogenized and TOBS data is getting less in this state, over time. 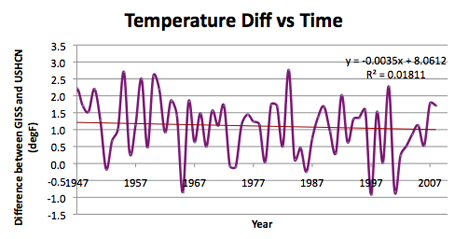 It has however been increasing since the 1970’s.